This gallery is a special one for me. As much as I love the rose paintings, when I look at some of the other possibilities for flower paintings I want to work on new portraits there also. I have tried the Iris and the Calla Lily but there are so many others. I am hoping to do an orchid soon. But even some of the common flowers we see every day such as the daisy are amazing when I study them in detail. There are so many choices - so many beautiful flowers. In California we have a wide range of Iris to enjoy. This is an import that does very well here. It is small and so beautiful during its short life. 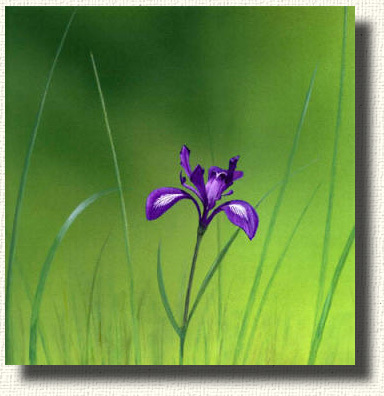 there are not many roses with any kind of blue or violet tint to them but the basic Iris family is almost all of that tint. This painting was such a pleasure just to play with such powerful pigments in the blue and violet family. Painting is, as one artist I know said, mostly pushing paint around a canvas. Well - pushing the beautiful violets around was such a pleasure. Iris, oil on canvas, 44" x 32". This is one of the great shapes in nature! The curves and the delicacy of form, of this flower, are pleasing to me every time I look at this painting. I am not commenting on my painting ability but on the beauty of the form. This is another flower that reminds me of the beauty of the feminine form. There is also a transparency of the petal - a kind of translucence - that is only seen after a long slow study of the Calla Lily. I hope to paint more of these in the next year. This and the Orchid are very high on my list. 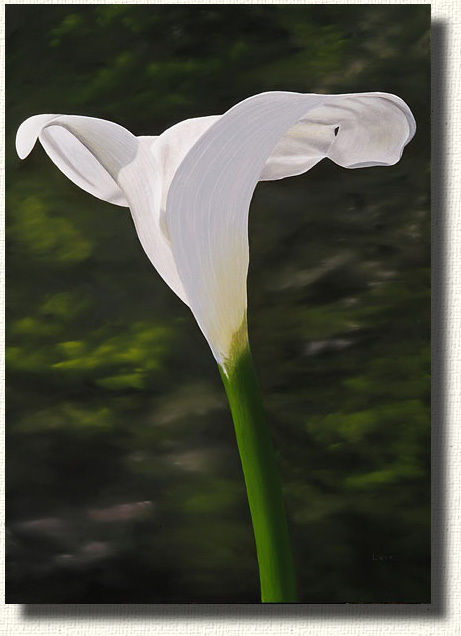 Calla Lilly, oil on canvas, 46" x 32"
This was a very early study I made of the wild California Iris that grows along the coast. I purposely arranged this composition for the single flower and for this combination of colors. 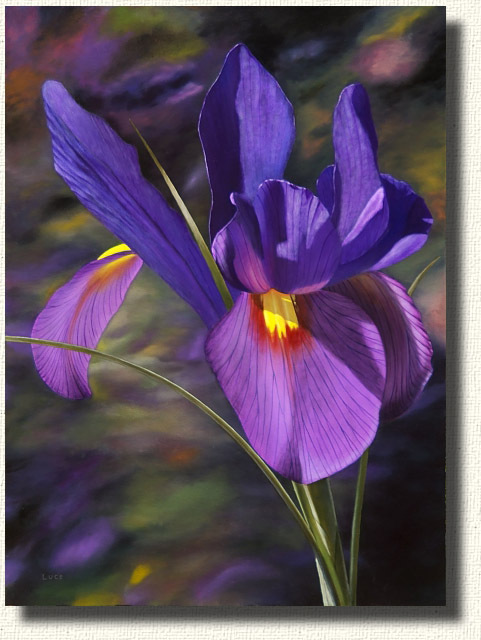 The yellow-green of the grasses and the violet of the flower are nearly complimentary colors causing a contrast that makes the flower almost stand out in three dimensions in the original. This painting also shows the value of the alone. It says that beauty can exist even when no one can see it. If a beautiful creation of nature is never seen is it still beauty? YES!